LONDON -- Jaguar is expected to reveal a new sports car in concept form at the Frankfurt auto show next month. The company told Automotive News Europe that a new concept was "likely" to form the centerpiece of its show stand, but said "it could neither confirm nor deny" recent speculation that the car would be a smaller brother to the XK. "Jaguar has bold plans for the future, the next stage of which will be revealed at the Frankfurt show," a spokesman said. "We are likely to have a concept car to announce there." Jaguar has made no secret of its desire to launch a rival to the Porsche Boxster, and on August 1 the British magazine Autocar quoted a source within the company as saying that its planned car "will blow the rest of the industry away." Speculation about the car grew last month when spy shots of a convertible mule cloaked in the shortened body of the firm's XK sports car were taken near Jaguar's base in Coventry, England. More recent shots of a similar mule have been snapped in the United States. According to Autocar, the potential new Jaguar, codenamed XE, is likely to be powered by V6 petrol engines, boosted by turbochargers. If such a car is revealed at the Frankfurt show, inevitable comparisons will be made with the Jaguar E-type, which turned 50 this year. 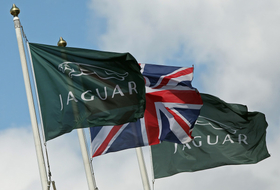 Jaguar has bold plans to grow its range, according to the firm. "We are investigating other areas of the market past the current XF, XJ and XK ranges," said the spokesman. "If business is going to grow, we've got to look beyond those markets." In February this year, Auto Express magazine quoted Jaguar's global brand director Adrian Hallmark as saying that future models could include a small car to rival BMW's 1-series. "We won't have a 1 series-sized car for five to 10 years, but we're working on some compelling alternative bodystyles that are anti-German luxury car establishment," Auto Express quoted Hallmark as saying. In May, parent company Tata reported that Jaguar Land Rover had made annual profits of 1.04 billion pounds (1.2 billion euros) on the back of strong growth in China. Sales of both brands rose to 243,621 units in the 2010-2011 financial year from 193,982 a year before.